In a recent GFO commentary, Ralf Jürgens, Senior Human Rights Coordinator at the Global Fund, flagged the need for increased Global Fund investment in programs which reduce human rights barriers to HIV, TB, and malaria services. Jürgens mentioned that far less than 1% of Global Fund money is spent on such programs, despite international consensus that this figure should be much higher. This article provides a closer look at how and where the Global Fund is investing in human rights programming; and explains that the Fund is being more transparent around where the funding gaps are, and how they may be addressed. Overall, the Global Fund is investing $32.1 million in human rights programs at country level, with an additional $15 million being spent at regional level. Human rights activities are typically contained in the removing legal barriers module of the concept note. They include approaches such as reducing stigma and discrimination; training or sensitizing health care workers or law enforcement agents; providing legal literacy and services; and conducting policy and legal advocacy. Table 1 presents a breakdown of the human rights activities that the Global Fund is currently investing in. Specific examples include activities in South Sudan’s HIV grant, where the Global Fund is supporting access to justice programs, including legal services. In Tajikistan, as part of the country’s TB grant, the Global Fund is investing in advocacy for the rights to health and social protection. Proportionally, the Global Fund invests far more in human rights programming in some regions than others (Table 2). In Latin America and the Caribbean, human rights funding makes up about 2.3% of all requested indicative funding. In Eastern Europe and Central Asia, it is about 1%. By contrast, in Sub-Saharan Africa, human rights funding comprises just 0.26% of total Global Fund investments. In the Middle East and North Africa, the proportion is about 0.33%. The UNAIDS Fast-Track approach calls for investments in programs to reduce human rights-related barriers to accessing services and other social enablers to reach 8% of total program funding for HIV by 2020. Similar resource needs analyses do not (yet) exist for TB and malaria. One of the reasons for the underfunding of human rights programs is that they are often implemented on a very small scale and, as a result, are not monitored and evaluated separately. Another reason is that human rights programs for TB and malaria have not been sufficiently defined and costed, as they have been for HIV. However, the main reason why human rights programs receive less Global Fund money than they should (according to UNAIDS Fast-Track modeling) is more straightforward: Countries are simply not requesting funding for these interventions. According to Tinashe Mundawarara, who is with Zimbabwe Lawyers for Human Rights, there is less appreciation of the need to cultivate human rights-based responses in Southern Africa and, hence, less inclination to include them in proposals. “The composition of writing teams for concept notes has not included human rights experts, and country dialogue mechanisms have not made use of human rights consultants,” Mundawarara explained. “As a result, there is a concentration of medical and other expertise in writing committees.” In addition, many CCMs in sub-Saharan Africa are having to choose among conflicting priorities, including care and treatment, which may help to explain why human rights programming is often crowded out. Out of 119 concept notes submitted to the Global Fund in Windows 1 to 5, 72% identified human rights barriers to access but only 10% actually requested funding for the corresponding removing legal barriers module (see GFO article). New information from the Global Fund reveals that there is a steep “human rights funding cascade” (Figure 1). Figure 1 clearly shows that the cascade is much steeper for TB and malaria applications than it is for HIV or integrated TB/HIV submissions. For example, although 35 countries submitted TB concept notes containing human rights analysis, just six have human rights programs with a traceable budget in their signed grants. 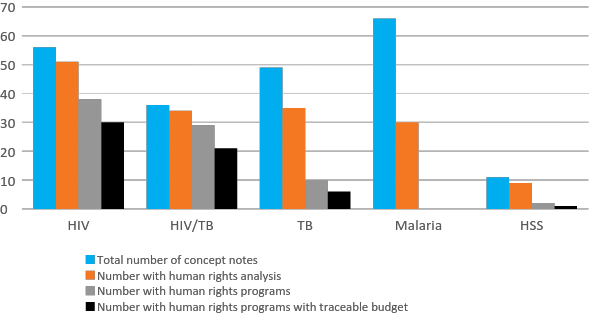 For malaria, although 30 concept notes contained analysis of human rights barriers, not one grant has a budget line to address them. It remains unclear how the Global Fund’s initiative to prioritize 15-20 countries for intense human rights efforts will reduce the imbalances in human rights funding among the three diseases. The programs supported as part of the initiative will be designed around the seven key interventions to reduce stigma and discrimination and increase access to justice identified by UNAIDS, suggesting they will be largely HIV-focused. According to the Fund, more work will be done in the second half of 2016 to clarify how human rights for TB can be elevated as part of the initiative, and there will be a second phase in 2017 to do the same for malaria. at least three countries are also part of the Global Fund’s Strategic Actions for Gender Equality (SAGE) initiative or are priority countries for PEPFAR’s DREAMS investment. The Fund intends to track these intensive human rights efforts through a new key performance indicator (KPI). This indicator will monitor progress towards establishing programs that reduce human rights barriers to services, focusing on the 15-20 priority countries. In anticipation of transition, the KPI will specifically monitor the scale-up of programs that reduce human rights barriers for key and vulnerable populations in middle-income countries, especially the degree to which governments are supporting and taking over these programs. Information in this article comes from a presentation delivered by the Global Fund on a partners call organized by the Community, Rights, and Gender Department of the Global Fund Secretariat on 7 July 2016. A copy of the presentation is available from the author on request (gemma.oberth@gmail.com).